All this means is that when Peter Langston designed the Wander system starting in 1974 (or possibly as early as 1973) the fact it is similar to Crowther’s Adventure is not without precedent. It indicates, instead, that perhaps there was something natural and inevitable about the act of moving a character around a world with verb-noun commands. However, there are puzzles. There’s a locked door, a river which is raging too fast for a boat, a wire fence, a bridge with a weight limit (dropping everything doesn’t make you light enough), and a well that needs a rope. That is, the verb is caught in a location-dependent way, and if the verb is usable in the location the parser gives it top priority and ignores the noun. Nice try, but that’s an old, worn-out magic word. In any case, despite the small size of the area so far I haven’t made any real progress. I do wonder if I’m missing something, because it doesn’t seem like there’s a lot of possibilities to hack at. I’m particularly suspicious of the boat, which I might be able to move further on land with just the right verb. I’ll report back when I have something actually solved. Well, I’ve made progress, but the hunger timer is so tight that gameplay feels like an IF version of Paranoia where I send out clone after clone to die, each time using knowledge from the last clone to get a little further. My suspicions from my last post were correct: I just needed to move the boat. and it was a silly verb issue. You can’t do that now. Silly in that I had already discovered earlier that TAKE was the way to get objects, but somehow that knowledge didn’t transfer to the boat because it was entirely plausible to block taking the boat from sheer size. Getting the boat moved led to getting a rope, and getting the rope led to getting some keys, and getting the keys led to access to a balloon and a ladder. You’re at the east end of a rickety wooden bridge crossing over a deep river. A road leads east toward a shallow valley filled with wildflowers. There is a large, official-looking sign here. You’re at the west end of a rickety bridge crossing a raging river. As you start to cross the bridge you hear a loud groan and feel the bridge sag. You drop the boat and rush back just in time to see the boat and the bridge collapse into the river and get washed away. Perhaps there’s a more clever way to get the boat safely to the right location, or another way to escape the forest with the shovel. I’ll report back when something happens. Or rather, finished one ending. According to the source there’s three endings, but they require an action in the winning path that crashes the game. I’ve worked out enough to describe what happens, though. 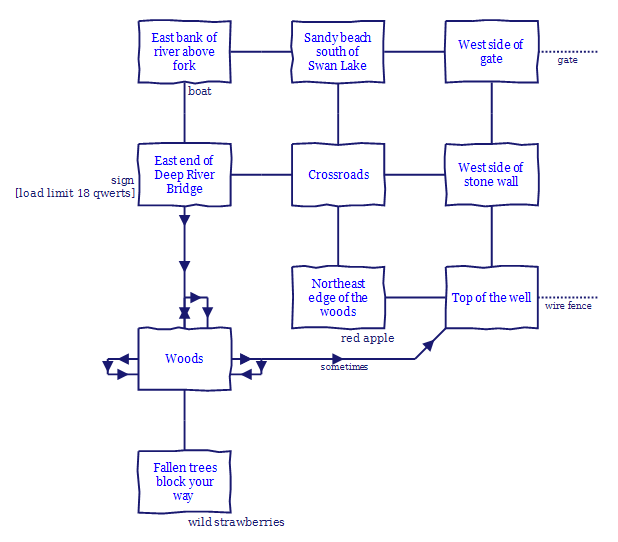 First, how I escaped the forest, which had the odd attribute of being acutely unfair in a game system but would make some sense in real life. You’re in a dark and dreary woods with dense foliage in all directions. Splashing sounds and bird calls seem to come from the east. The way is blocked by a deep river. This spot looks awful familiar. I am not ashamed to say I had to check the source for this. 1.) There’s a sack of potatoes inside. Once eaten I had no more problems with hunger. 2.) There’s a “true maze” of cells in the basement, but it is totally possible to ignore it. I only partially mapped it above because it was clearly not leading anywhere. 3.) There’s a missile silo which lets you launch at the portcullis to blow it up. Obviously the game didn’t have a lot of concern about sticking to a particular time period of technology. As I already mentioned, there are three endings. DAMSEL ENDING: The damsel is in a room named “Rapunzel’s Tower”. You’re high above the castle in the east tower; in fact, you are so high up that you can see clouds outside the window. A spiral staircase leads down. You hear a sound like stone grating on stone. There is a 30 foot long wig here. “Made in Hong-Kong, Inspcted by no 1” — the wig starts to shred!! and just manage to get into a window as the wig falls apart. I am very uncertain of the physics of this situation: How were you lugging around a giant wig? How would anyone wear such a wig anyway? What is the wig attached to as you’re doing this? How are you carrying a damsel at the same time? In any case, after this rescue there’s a clear route back to the opening room (the “cross-roads” the damsel mentions) at which point you are taken to “nirvana” and win the game. FROG ENDING: Getting to the frog ending seems to require using the missile silo I already mentioned, but also smashing a chain with a mace (which lowers the drawbridge). The bit that involves getting a mace is what crashes the game. I’ll just reproduce the raw source code. magic?) force. A small black and yellow sign is posted on the wall. “clank … … K A B O O M ! ! The slight shock seems to have detonated some plastic explosive! In any case, getting through both leads to a frog, which can be carted back to the Crossroads just like damsel. He then turns into a prince and you are taken to Nirvana to win the game. DAMSEL AND FROG TOGETHER: Yes, the game is socially liberal enough you can both rescue the frog and damsel. You will all go to Nirvana together. I’m not sure I’m ready for “final thoughts” here — I think I need to try the other offerings from the Wander system before I decide. The parser system in Castle is a little too erratic for me to recommend it just as a game, but it’s worth a try based on historical merits. The online version located here is the easiest to get to, although my original post has links to compiled versions.